No finished projects to show. 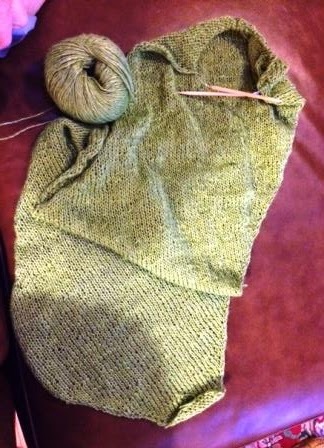 My current knitting project is a shawl using the same yarn as this top. The yarn is Classic Elite Yarns Firefly. I started a scarf using a very simple pattern (Firefly Scarf) as I had received a notice for jury duty and wanted something I could take with me. I lucked out as I was later notified the cases for my week were all canceled. The scarf pattern in the yarn looked so blah that I unraveled it and chose a different pattern. Here's the firefly scarf approximately two thirds done before I unraveled it. I think the scarf would be lovely in a different yarn. This next photo is of the shawl that I am now working. I like it much better. 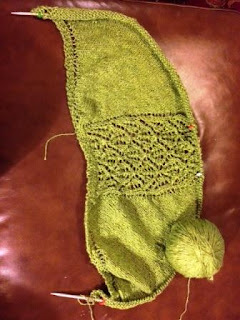 The pattern is Pear Sorbet Shawlette by Marly Bird.